I recently installed the latest version of Maxthon on my new ultrabook and the AD block extension seems to be missing. Is their a way to re install AD Block? After installing that extension, Adblock Plus appears, but does not seem to work. I am unable to download filter lists for use in Adblock Plus and the "adb:" links do not work. I am uning Maxthon v5.2.4.3000 with the Adblock Plus 1.0.0 Maxthon extension on Windows XP Professional with Service Pack 3. 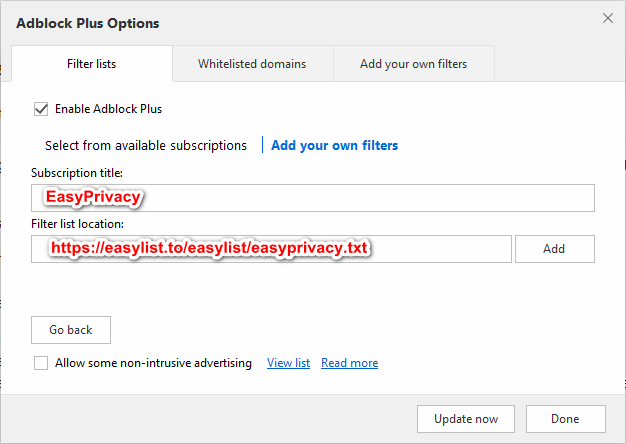 Use the Adblock Lists from here. https://adblockplus.org/subscriptions. Right click on the Subscription required and "Copy Link". Paste link into Adblock. Thank you Magdalene. That is the workaround that I have been using. ABP errors need to delete userdata sometime.